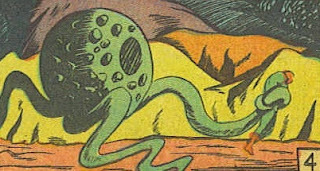 For #MonsterMonday...here's another Underground Elemental Beast pulled from a public domain comic (the Blast Bennett story in Weird Comics #9). It was designed with 5E in mind but should work somewhat reasonably with any icosahedral ruleset. Targets hit by a Quadropod's Grab are typically held for one round. While held, any intelligent being is unable to move due to the sheer fright conveyed by the Quadropod's tentacles. 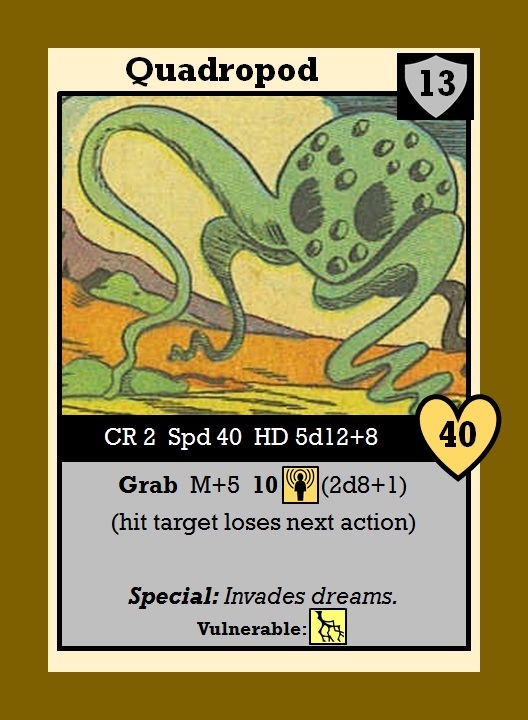 Unintelligent beings may escape (and take an action in the subsequent round) if successful on a moderate difficulty (DC 15) Strength saving throw; they are also not vulnerable to damage from the attack. Upon sleeping for the first time after being grabbed by a Quadropod, a sentient being is in danger of having its dreams invaded by the monster. The being must succeed at an easy (DC 10) Wisdom saving throw or take 5 (1d4 + 1) psychic damage upon waking. After a failed saving throw, the DC of the check increases by 5 with the next sleep. The pattern can be ended with a successful save or curing via magical means. Quadropods are usually solitary and are often found in regions that have experienced great joy or extreme psychological trauma. They move very methodically, picking up sentient beings long enough to absorb some of their psychic energy, then placing them back down and moving on. Many observers believe that the monsters are part of a hive mind that is simply working to catalog the spectrum of emotional experience on the material plane. Others feel that something more nefarious is in play. Quadropod hides are prized for their use in leather armor.